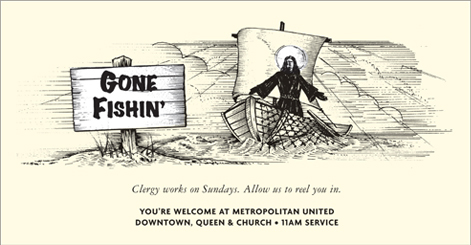 One of wishart’s most effective and enduring advertising campaigns has been for Toronto’s Metropolitan United Church. It is proof of our ability and commitment to create great work year after year… after year! TO SUMMARIZE: Churches are in decline. Membership is down. So are givings. Those who attend are mostly old – and growing older every day. Young people generally don’t (and won’t) go to church. The faithful are losing faith. Sadly, churches have become something of a tired commodity for people to ‘consume’ only when they want core rituals: baptisms, marriages and funerals. (Or, as some jaded church leaders say: “hatching, matching and dispatching.”) To make matters worse, churches are traditionally lousy at promotion. Ads, if they appear at all, are often phoned in to the local paper by a church secretary who offers only the name of the church, sermon title, preacher and time of worship as if that were enough to motivate the ‘unchurched’ to attend a service on any given Sunday. wishart volunteered for the challenge of creating ads on behalf of Met in 1992 when it became apparent that their ads couldn’t get any worse. Metropolitan has never been one of wishart’s ‘big money’ accounts; don’t tell anyone but we’ve always done it for free. Metropolitan – now a 190 year-old Church – has a renewed sense of optimism and its large sanctuary seems to be filled most of the time. About 400 ads were created and rotated throughout the years, a few of which are shown here. All but three were done in black and white, and most appeared no larger than the size of a business card. Advertising was part of Metropolitan’s success. True, it’s impossible to quantify exactly how large a part, but the success was real and helped sustain the Church at a time when many other congregations were shrinking. What wishart did – or at least helped do – for Met we can do for you. As good or better than any other agency. OUTREACH – being in touch with the needs of others; a responsiveness, and compassion for those in the church community and throughout the world. But “rather than shopping for fragments,” say Posterski and Barker, authors of Where’s A Good Church, “Christians want a meaningful, integrated experience of faith.” What makes Metropolitan an effective church is that its sum is greater than the individual parts of orthodoxy, community, relevance and outreach. 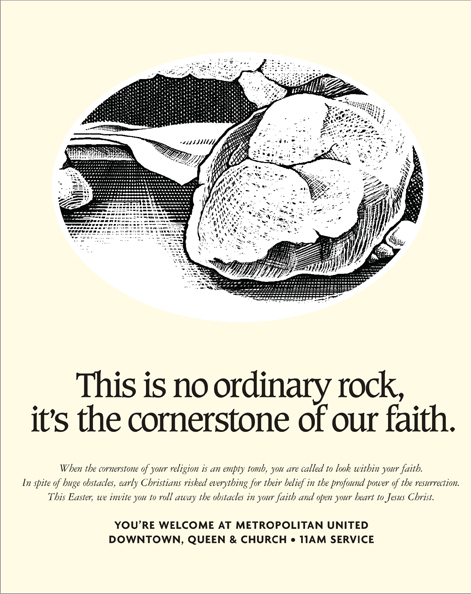 When creating advertising for Metropolitan, wishart’s strategy was to create awareness of the church’s many strengths by addressing the four ‘cornerstones’ in a unique and meaningful way. Not any one ad even attempted to address all four cornerstones but when seen week after week it became clear to people that Metropolitan was a Church worthy of a visit.